"Young girls are sure to be inspired with the wide variety of shapes available in our 62Pc Design set. For advanced builders, the Designer set arrives with 5 geometric shapes in purple, pink and teal, for endless fun! Use squares, triagnles, isosceles triangles, trapezoids and diamonds to construct ‘magic balls’, hearts, houses, princess castles and much more! What will you design!? 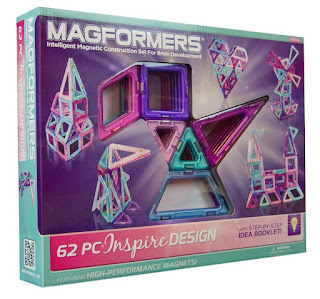 Magformers Inspire Design 62PC Set is an awesome set for any little girl! This Inspire Design Set comes with a wide variety of shapes allowing their creative building skills to stretch even further than ever. My girls love the step by step booklet that shows them how to build a castle, heart and much more. They absolutely love this set because it is in girls colors and lets them build just about whatever their hearts desire. I love that this Magformers Inspire Design 62PC Set inspires little girls to build and goes beyond just stacking blocks. I also love that this set is made from BPA Free HQABS Plastic. This would make a terrific gift for any young girl this holiday season! Build, create, race! Children can design 14 different cars and 10 different motorcycles by following the step-by-step idea booklet included in the Racing Set. Magformers Racing 39PC Set is so cool! This set comes with 12 Geometric Shapes allowing them to build just about any vehicle they desire. The Step-by-step idea booklet shows children how to build certain vehicles but my favorite thing is watching my kids get creative on their own and seeing all the wonderful ideas they come up with. The cars are fun to drive and my kids thoroughly enjoy that they can create vehicles that actually move. I love that this set is made from BPA Free HQABS Plastic. I also love that this set is compatible with all other Magformers shapes and accessories allowing my children to use parts from their other sets. This would make and incredibly fun gift for kids this holiday season! 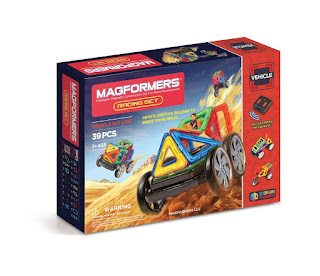 Click HERE to find a store near you that sells Magformers!